The story takes place in Washington DC over a period of 12 hours. 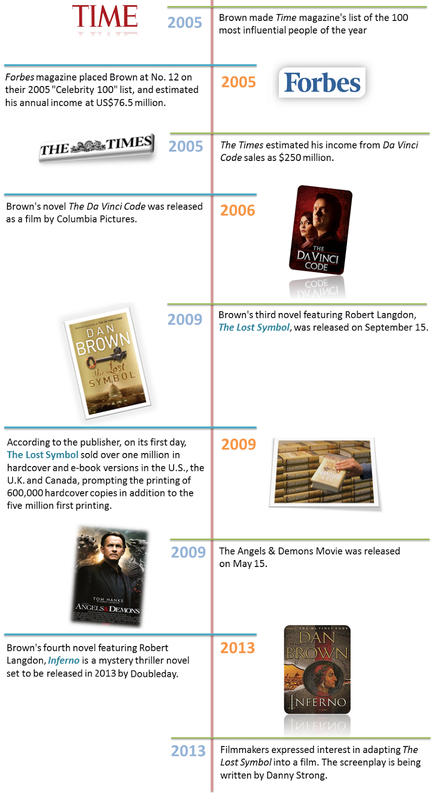 Robert Langdon: A Harvard symbologist, the protagonist of many Brown’s thrillers. Peter Solomon: Robert’s friend and mentor, he is a Mason historian and philanthropist, and serves as the head of the Smithsonian Institution. Katherine Solomon: Peter’s sister, a researcher in a new cutting-edge discipline called Noetic Science. One of the goals of her research is to prove that Human thought can literally transform the physical world. Mal’akh: Peter’s captor, a massive creature all covered with tattoos. His ultimate purpose in life is to reach the extreme power that allows him to be immortal and above humans. He thinks that unveiling the Ancient Mysteries of Masonry is the key to reach this power. Inoue Sato: The Director of the CIA’s Office of Security. She shows up unexpectedly at the Capitol Building and takes in hand the search of the Ancient Portal arguing that it’s an issue of national security. Warren Bellamy: The Architect of the Capitol Building, he helps Robert to run away from the Building. Colin Galloway: The Dean of the Washington National Cathedral, he helps Robert to decipher the Pyramid and unveil the hidden truth. Zack Solomon: Peter’s son, he died in a prison in Turkey. Trish Dunne: Katherine’s assistant and a metasystems analyst, she finds a mysterious document about the Masonic Pyramid on the web. Mark Zoubianis: A Systems Security Specialist and a hacker, Trish asks him to unmask the IP of the encrypted document. Nola Kaye: A Security analyst in the CIA. Sato relies on her to do research about the history of Masonry in order to find the hidden treasure Mal’akh is looking for. Rick Parrish: He works in the systems security of the CIA. He detects an illegal access to the CIA internal Database. Trent Anderson: The Capitol police chief, he helps the CIA in their investigations. Turner Simkins: A CIA field Agent, he works with Sato to catch Peter’s captor. Alfonso Nuñez: The security agent of the Capitol Building. Omar Amirana: A Taxi Driver. 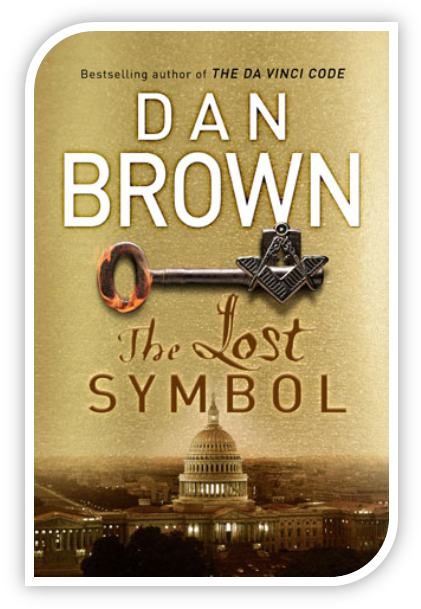 The story begins when the Harvard Symbologist Robert Langdon is invited unexpectedly by Peter Solomon’s assistant to hold a lecture in the Capitol Building of Washington DC. Since Robert has always considered Peter as a close friend and mentor, he couldn’t decline his invitation even if the lecture is supposed to take place the same day. When he gets to the Building and finds no one, he calls back his friend’s assistant, and at his surprise, Robert finds out that this latter is a lunatic who pretends having kidnapped Peter. The captor asks Robert to help him unlock the Ancient Portal if he wants his friend back. Few seconds later, his friend’s hand is discovered in the Capitol Rotunda. The hand was covered with 5 different tattoos, and Robert recognizes it as a mystical invitation to receive secret knowledge. The Harvard Professor has then no choice but accepting the invitation and following the captor instructions in order to save his mentor. For an unknown reason, the OS Director takes in hand the case of Peter’s kidnapping, and tries with Robert to find the hidden Portal. At the same time, the so-called Mal’akh impersonates Peter’s doctor to get in contact with Katherine Solomon in an attempt to steel the result of her scientific research in Noetics. Deciphering the tattoos in Peter’s hand leads Robert to discover new secrets, strange artifacts and heretofore unseen places, all related to the Mason Doctrine to which belongs his friend Peter. Along the way, Robert has to use his knowledge as a symbologist to decrypt mysterious codes, enigmatic symbols and arcane maps to unveil the truth of the Ancient Portal and to be able to save his friend before midnight. 1. The novel is in my opinion a successful thriller; it is full of suspense, the events and the end are unexpectable, and along my reading, I was always excited to know the next event. 2. The story is well written, the events are coherent, and the author blends fiction and reality in a wonderful and a professional way. 3. The novel is rich of information from different fields, such as, theology, history, computer science, medicine, arts… and what is awesome is that the author could combine all this information to build one single story. To this day, the noble descendants of the Adepts soldiered on, grasping blindly for the Light, trying to recapture the lost power of their past, trying to keep the darkness at bay. They were the priests and priestesses of the churches, temples, and shrines of all the religions on earth. The author talks about a lost knowledge or power that was hidden by the adepts of all religions. However, Islam is not concerned by this statement, there is nothing hidden in Islam, or at least nothing is hidden, on purpose, for fear of misusing it by some ignorant people. On one hand, the Holy Quran is the reference of Muslims, and the constitution from where they extract their doctrine and law, that’s why Allah made it crystal clear and easy-to-understand. It’s only a matter of research and study; the more you learn the Quran the more you understand it. On the other hand, even if some verses have been recently explained after the technology has made progress, the only thing we deduct from these new explanations is that the Quran is truly sent by Allah, the Creator of the Universe, and the one who knows all its heretofore unknown secrets. In short, there is no knowledge hidden by the Ancients from the unworthy people, because In Islam, all people seeking the truth deserve to know it; The first word sent by Allah to his prophet was “Read”, which is an invitation to all Believers to always keep looking for Knowledge and Truth. Consequently, I think the author sometimes falls into some generalizations without taking his time to check their validity. Every culture on earth had its own sacred book - its own Word - each one different and yet each one the same. For Christians, the Word was the Bible, for Muslims the Koran, for Jews the Torah, for Hindus the Vedas, and on and on it went. For America’s Masonic forefathers, the Word had been the Bible. And yet few people in history have understood its true message. Masons were also Jews, Muslims, Buddhists, Hindus, and those who had no name for their God. What I can’t understand is how a Muslim can be a Mason?! It has no sense. The reference of a Muslim is the Quran and the reference of a Mason is the Bible, and the two books are based on completely different doctrines, so it’s obviously contradictory to be a Muslim and a Mason at the same time. The notion of a Universal Religion doesn’t make sense to me; either you are a Muslim, then you believe in one God “Allah”, or you are Christian and you believe in the Father, the Son and the Holy Spirit. You can’t be both at the same time!! This treasured book, like all Masonic Bibles, contained the Old Testament, the New Testament, and a treasure trove of Masonic philosophical writings. The ‘dark sayings’ in the Bible are the whispers of the ancients, quietly sharing with us all of their secret wisdom. The author states here that the Masonic Bible is written by Humans. Why does anybody have to believe in a Doctrine written by human beings, when there is a religion sent by the Creator, the All-mighty and the All-wise? It sounds unreasonable to me. We’ve lost the Word, and yet its true meaning is still within reach, right before our eyes. It exists in all the enduring texts, from the Bible to the Bhagavad Gita to the Koran and beyond. The author states that all the sacred books (including the Quran) say that humans are gods. However, the proofs he gives are only from Buddhism and Christianity, what is his proof from Islam? I dare him to find a verse in the Quran that says that! Again, the author falls into the trap of generalization. I don’t know how a sacred book can be interpreted that plainly?! And why would it be encrypted? I think a sacred book must be clear and apparent and its interpretation must be well-founded and justified for fear of distorting its meaning. We see ourselves as helpless sheep buffeted around by the God who made us. We kneel like frightened children, begging for help, for forgiveness, for good luck. But once we realize that we are truly created in the Creator’s image, we will start to understand that we, too, must be Creators. When we understand this fact, the doors will burst wide open for human potential. What is this supposed to mean? That we are so powerful that we don’t need God? God gave us some power, yes, but this is nothing compared to the All-mighty’s power. We are still dependent to God, we still need his help and his forgiveness and we still have to kneel like frightened children because our destiny is in his hands. The idea itself is correct; thoughts can affect people and the whole world both in positive and negative ways. But in this context, the idea is not accurate, because the author means a physical impact, a transformation of the physical world, which is not scientifically proven. They may be some phenomena here and there, but they are exceptions and don’t prove that Humans have an unlimited power that allows them to be independent from God. We are builders, he thought. We are creators. Since the beginning of time, man had sensed there was something special about himself... something more. He had longed for powers he did not possess. He had dreamed of flying, of healing, and of transforming his world in every way imaginable. It’s true that Human beings are today capable of flying, healing people through medicine, setting up high buildings, and communicating with each other despite the long distance separating them. But let’s not forget that all this is possible thanks to our Minds, which are a gift from God. This gift, though powerful and sophisticated, is still limited. One obvious proof is that we can create neither human beings nor animals, nor anything that has a soul. Only God can do that. From a literary standpoint, I genuinely liked the novel, it is a real success. But I if we talk about thoughts, I disagree with almost all the theological conclusions the author has made. So I rate the book 3/5. Dan Brown (born June 22, 1964) is an American author of thriller fiction, best known for the 2003 bestselling novel, The Da Vinci Code. 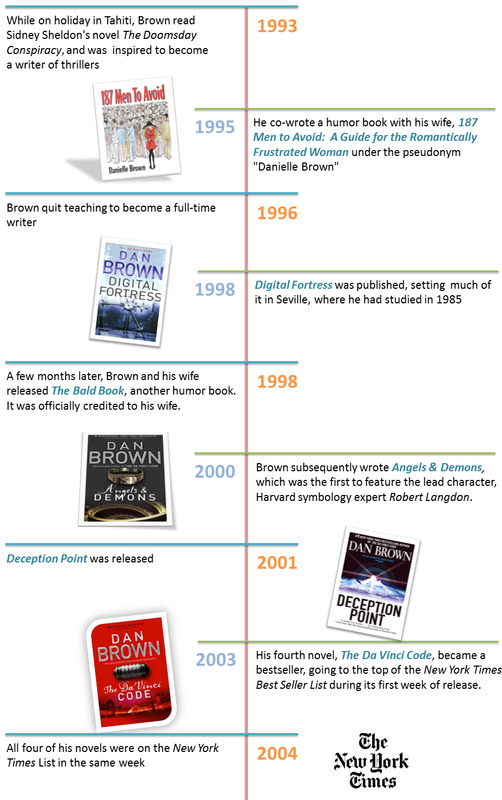 Brown's novels are treasure hunts set in a 24-hour period, and feature the recurring themes of cryptography, keys, symbols, codes, and conspiracy theories. 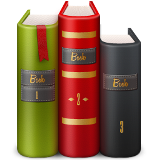 His books have been translated into 52 languages, and as of 2012, sold over 200 million copies. Two of them, The Da Vinci Code and Angels & Demons, have been adapted into films. 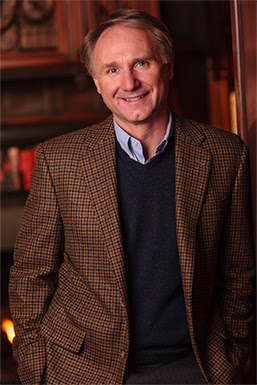 Dan Brown was born and raised in Exeter, New Hampshire, USA, the eldest of three children. His father, Richard G. Brown, was a teacher of mathematics and his mother was a church organist. Both of Brown's parents are also singers and musicians, having served as church choir masters. In his childhood, the young Brown grew up on the campus of Phillips Exeter Academy, where he developed a fascination with the paradoxical interplay between science and religion, and he was surrounded by codes and ciphers from the mathematics, music and languages in which his parents worked. After graduating from Phillips Exeter, Brown attended Amherst College, where he was a member of Psi Upsilon fraternity. He played squash, sang in the Amherst Glee Club, and was a writing student of visiting novelist Alan Lelchuk. Brown spent the 1985 school year abroad in Seville, Spain, where he was enrolled in an art history course at the University of Seville. He graduated from Amherst in 1986. After graduating from Amherst, Brown dabbled with a musical career, creating effects with a synthesizer, and self-producing a children's cassette entitled SynthAnimals, which sold a few hundred copies. He then formed his own record company called Dalliance, and between 1990 and 1994, he self-published many CDs. He also joined the National Academy of Songwriters, and participated in many of its events. It was there where he met his wife Blythe Newton who was the Academy's Director of Artist Development. In 1993, they moved together to his home town in New Hampshire, where Brown became an English teacher at his alma mater Phillips Exeter, and gave Spanish classes at Lincoln Akerman School. Interests : Software Engineering, Reading, Personal development, and Management. Interests : Information Technology (BI & Big Data), Reading, Travel, and Social Activities.